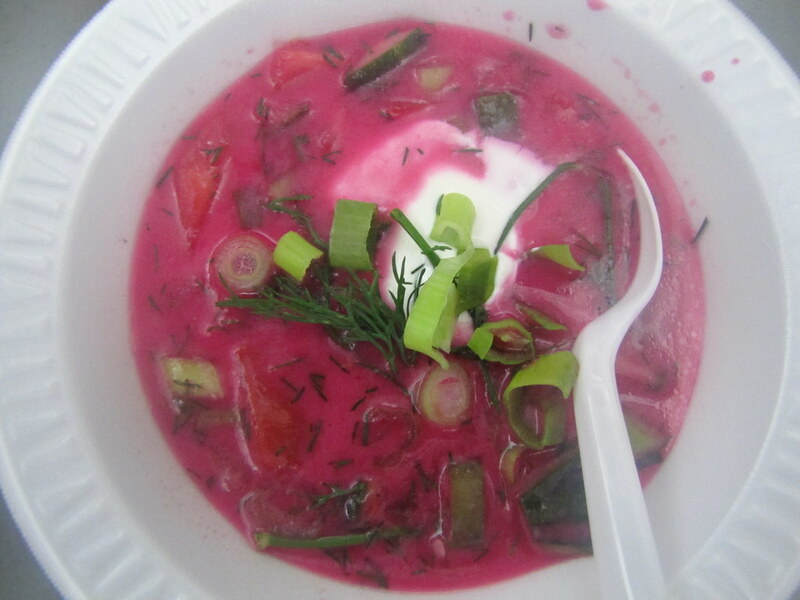 “Flu borscht” just didn’t sound like a very good name, though. 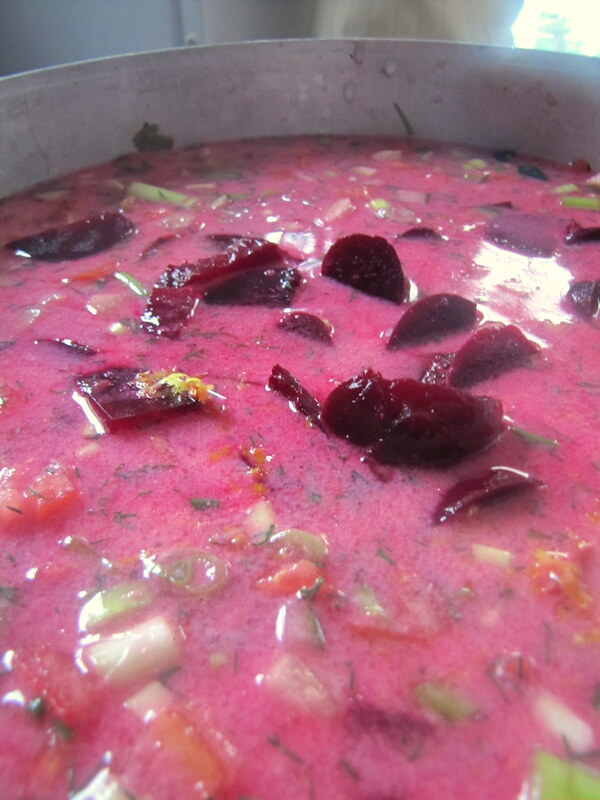 Summer borscht is actually what the recipe’s creator, Jui Shih, named this soup herself. It’s fresh and light like a summery breeze from chunky chopped tomatoes, cucumbers and dill; it has the zing of red wine vinegar, lemon juice, plain yogurt and sour cream; and a crisp finish of scallions and chives. And it’s served chilled, or room temperature. It’s sort of like gazpacho, but with beets. That was the main course, in the video — stuffed cabbage. Inside was a mixture of ground chicken, rice, diced red pepper and onions, and once rolled up in blanched cabbage leaves, it was drenched in a savory tomato sauce and baked. This was quite a different meal altogether than the one that Jui had won the Souperdouper Sandwich Cook-Off with. Scrapping the sandwich concept entirely, she decided to focus on the cuisine of the community — Polish. Greenpoint, Brooklyn is predominantly Polish, and many of the people who come to eat at this church’s soup kitchen are, too. So she wanted to serve them some familiar fare, but with her own twists. 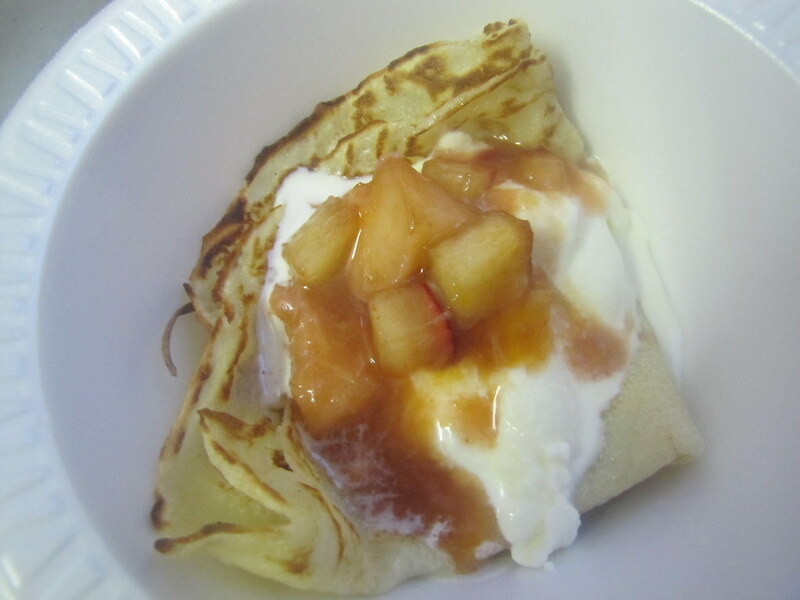 Along with the cabbage rolls, she came up with some incredibly tasty potato and turnip latkes, served with homemade applesauce and sour cream, this summery take on beet borscht (recipe below), and a dessert of crepes with fresh fruit compote and homemade vanilla ice cream. Okay, so maybe the sweets weren’t that Polish. But they were certainly a highlight. Some of the vegetables that we were able to use for this dinner included those from Garden of Eve Farm, whose CSA pick-up location in Greenpoint happens to be this same church. 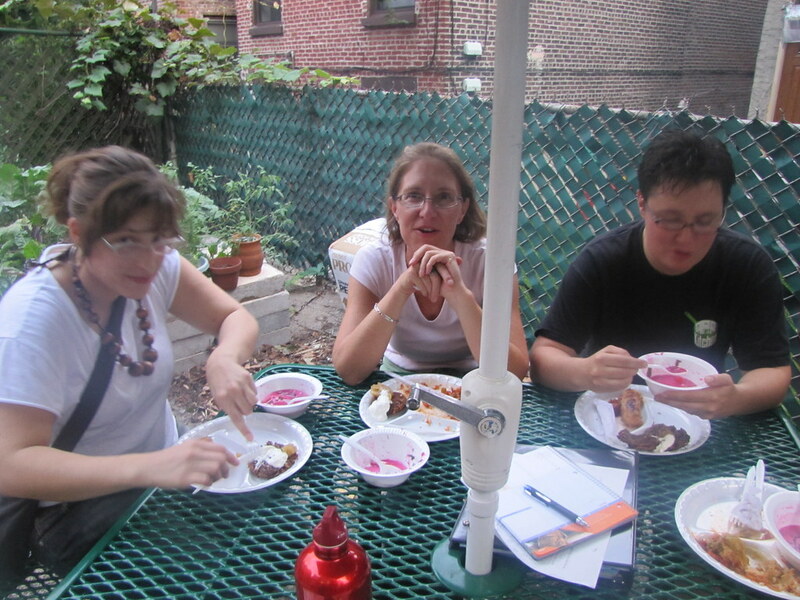 The Greenpoint Interfaith Food Team regularly gets to cook with these leftovers, as well as receives donations of food from nearby businesses, and other local farms. 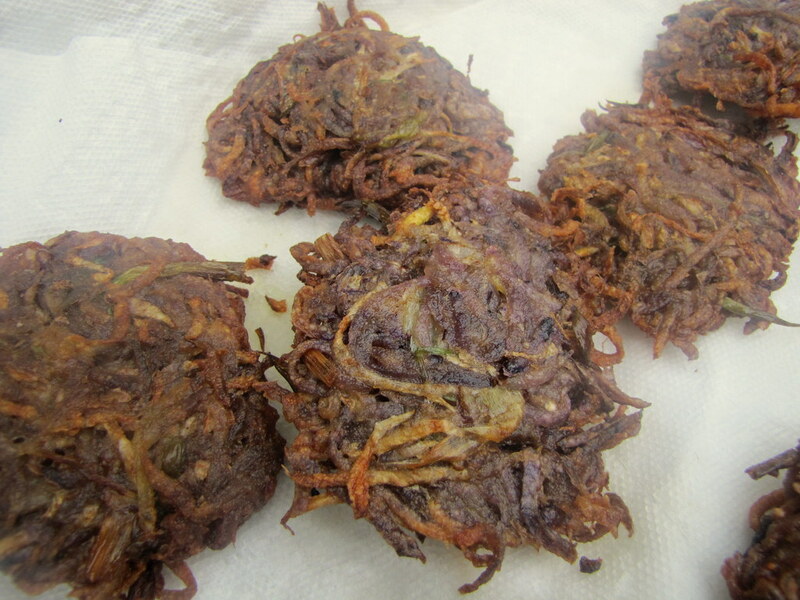 Jui had originally wanted to shred up sweet potatoes for the latkes, for instance, but when CSA pick-up day left behind a few pounds of purple fingerlings, as well as some turnips, it was purple potato latkes with shredded turnips instead. Fried in a shallow bath of cooking oil, these were just irresistible. Of course, healthiness is a factor for all the meals that are served at the soup kitchen, but deliciousness of this one was really a special treat. Reserve any juices from the beets, tomatoes and cucumbers while chopping and combine them in a large pot or bowl with the broth and yogurt. Add the vinegar, dill, a pinch of salt and pepper, and taste. Sugar can be added to cut the acidity as well, to taste. Add optional lemon juice and anything else to taste. Top each bowl with optional garnishes of chopped scallions or chives, extra dill, and/or a scoop of sour cream. Thanks buddy. I thought that this is a decent read. Can you link us a website with lots more stuff like this?